Most notably this was thanks to the massive limited debut of Tomas Alfredson’s “Tinker Tailor Soldier Spy.” According to estimates provided by Rentrak earlier today, the Focus Features-released film, which is already a huge hit in its native UK, had the third highest limited debut of 2011. On 4 screens, “Tinker” grossed a stunning $300,737, which amounted to a $75,184 per-theater-average. That follows only “Midnight in Paris” and “The Tree of Life” in terms of 2011 averages, and is among the 30 best averages of all time. “Tinker” – a spy thriller starring Gary Oldman, Colin Firth, Tom Hardy and John Hurt – played 2 theaters in LA and 2 in New York. Its best showing was the Arclight in Hollywood, where it is estimated to gross $93,814. Two other films also debuted to very strong numbers. Paramount released Jason Reitman’s dark comedy “Young Adult” on 8 screens and saw a $320,000 gross. That amounted to a potent $40,000 average for the film, which stars Charlize Theron as an alcoholic teen fiction writer who comes back to her hometown to wreck havoc. While strong, the numbers failed in comparison to Reitman’s previous outings. In 2009, “Up In the Air” averaged $78,763 from 15 screens, while “Juno” averaged $59,124 from 7 screens in 2007 and “Thank You For Smoking” averaged $52,584 from 5 in 2006. Paramount will expand the film significantly next weekend. 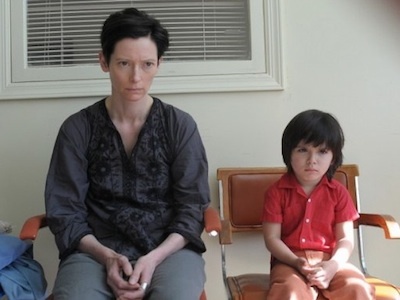 Oscilloscope debuted Lynne Ramsay’s “We Need To Talk About Kevin” on a sole screen at New York’s Angelika Film Center this weekend for an Oscar qualifying run (it will be released into theaters again come January). The film, which stars Tilda Swinton as the mother of a teenager who goes on a shooting rampage at his school, grossed an impressive $24,000 over the weekend. Steve McQueen’s “Shame” expanded from 10 to 21 screens this weekend for Fox Searchlight. The NC-17 rated film starring Michael Fassbender and Carey Mulligan grossed $276,068 as a result, averaging $13,146. The film has now totaled $774,154. Thats nearly six times the final gross of McQueen and Fassbender’s last team-up – 2008’s “Hunger,” which ended up with a $154,084 gross. Kino Lorber’s “Khodorkovsky” held steady on a sole screen at New York’s Film Forum in its second weekend. The film grossed $5,500 over the weekend to total $19,714. Meanwhile, Alexander Payne’s “The Descendants” continued its triumphant run. Expanding to 876 screens (up from 574), the film grossed $4,385,000 over the weekend, averaging $5,006. That gave the film, starring George Clooney as a Hawaii land baron, a very admirable new total gross of $23,635,423. “My Week With Marilyn,” which stars Michelle Williams in a heavily Oscar-buzzed role as Marilyn Monroe, marked one of two major releases from The Weinstein Company heading into their third frames. Holding steady on 244 screens, the film grossed $784,000, dropping off a fair 34% from last weekend. That resulted in a $3,213 average and a new total of $5,121,839. The Weinsteins’ other film – Michel Hazanavicus’ “The Artist” – expanded from 6 to 16 screens in its third weekend. The result was a $292,130 gross, up 38% from last weekend’s numbers. With an average of $18,258 per theater, “The Artist” saw its 17 day total gross stand at $885,510. For a silent film with no recognizable stars, this is clearly a very impressive result so far. “Shame” star Michael Fassbender’s other major specialty release – David Cronenberg’s “A Dangerous Method” – also held on well. The film, which stars Fassbender as Jung and Viggo Mortensen as Freud, held steady on 4 screens and grossed a strong $80,125. That made for a $20,031 per-theater-average, joining “Tinker,” “Adult,” and “Kevin” as one of four films to have $20,000+ averages, which is impressive. “A Dangerous Method,” which is being released through Sony Pictures Classics, now has a total gross of $539,134 despite a very small screen count three weeks running. Pedro Almodovar’s “The Skin I Live In” dropped from 116 to 109 screens in its ninth weekend, grossing $111,000 with an average of $1,018. The Sony Pictures Classics-released film’s total climbed to $2,833,000 as a result. Almodovar’s last film, “Broken Embraces,” ended up with a $5,014,305 final gross. Those numbers are out of reach for “Skin,” though it is not benefiting from the marketable presence of Penelope Cruz. Emilio Estevez’s “The Way,” starring his father Martin Sheen, dropped from 160 to 120 theaters this weekend via a unique partnership between Estevez, Elixir Films, Producers Distribution Agency and ARC Entertainment. The result was a $123,396 gross and a $1,028 average. The film’s total now stands at $3,836,967. Roadside Attractions also continued to find great news from JC Chandor’s Wall Street-set “Margin Call.” The dropped from 150 to 1542 screens in its eighth weekend and took in $204,400. That made for a $1,400 average and a new total of $4,973,150 The film is clearly turning into quite the success story, partially thanks to timing that couldn’t have been more appropriate given the Occupy Wall Street protests. The $5 million mark should have no trouble getting crossed any day now. Check out further analysis on the success of both “The Way” and “Margin Call” here.